The Researcher's night in Tunisia is an open event aiming to bring the opportunity to the general public, including young students and researchers, to discover the research activities carried out in Tunisia as well as international projects funded by the European Union in the framework of the Horizon 2020 research and innovation programme. 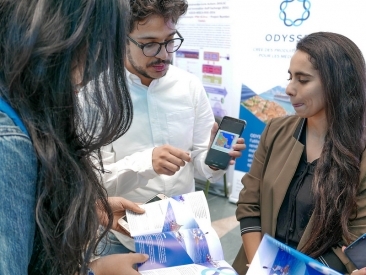 In this context, SPA/RAC and the association ANDDCVS, the Tunisian partner of the project, held a stand to present the ODYSSEA platform and the ongoing project to develop it. Moreover, a poster has been prepared and presented by the Tunisian students who attended the first ODYSSEA summer school at Kavala, in Greece, (3-13 September 2018), on operational oceanography for science, business and society. As a reminder, ODYSSEA is a user-oriented operational oceanography programme that aims to make Mediterranean marine environmental information and data easily accessible to a wide range of end-users.